This Japanese woodcut (left: click on image to enlarge; by K. Egawa after a painting by Ryūrikyō, 18th century. Wellcome Library no. 730398i) can be considered from several points of view, one of which is its unwitting role as an illustration of evolution, or rather coevolution. 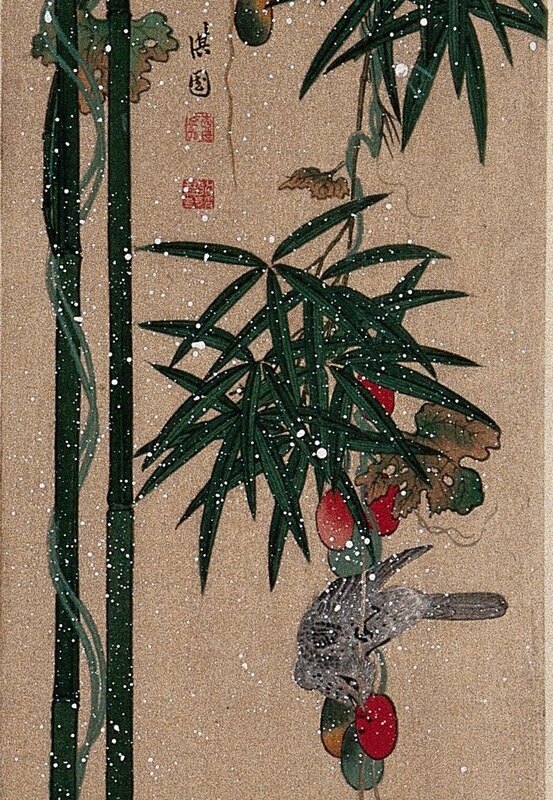 A pair of vines climb up around the stem of a bamboo plant, which helps the vines to grow fruit that serves as food to a grateful bird. Each of the three organisms has an environmental niche enabled by the other two. For example the bamboo serves as a support to the vine enabling the latter to expand its trunk and extend its branches. The bird uses the grape as food and then returns the favour to the vine by kindly depositing the seeds of the grape elsewhere in a ready-made bed of nitrogen-rich fertilizer. Bamboo is grown by humans for innumerable purposes such as bamboo shoots for food and bamboo stems as scaffolding for buildings. Conversely, vines that were less able to entwine themselves around the bamboo, or failed to grow big juicy grapes, failed in the struggle for life and are no longer with us, and the same is held to be true, mutatis mutandis, for bamboo and birds. One would think that Charles Robert Darwin would have relished it — all the more so because one of his lesser known publications was a treatise ‘On the movements and habits of climbing plants’ which was read on 2 February 1865 to the Linnean Society of London, published in its Journal in the same year, and reissued with a different title and revised text in 1882 (and subsequently). He discusses questions such as exactly how climbing plants like the vine manage to pull themselves up round any kind of support such as a vineyard trellis or a bamboo. He replies with a remorselessly systematic micro-analysis of the mechanisms involved: climbing plants are of two kinds, those that revolve around a stem and those endowed with irritable organs which, when they touch any object, clasp it. Torsion, rotation and circumnutation are among their subroutines. The movements and habits of climbing plants, London 1891, p. 165. However, the larger implications are always present. For example, how does the vine find the bamboo in the first place? Natural selection is predictably his ready-made reply: “The first purpose of the spontaneous revolving movement [of an entwining plant]… is to favour the shoot finding a support” (revised version pp. 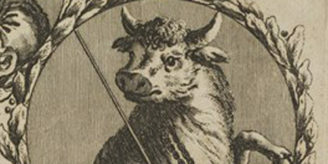 14-15). Note the value judgment in the last sentence. In describing the tendril as having “done its work … in an admirable manner “, Darwin uses language that that would normally be applied to a craftsperson such as the Japanese artists of our woodcut. A positive admirability in carrying out a defined task seems to be what drives all the processes mentioned here. It is what makes people want to buy and disseminate the work of the painter Ryūrikyō, while the lack of it in lesser painters prevents the survival of the works of these latter. In fact there are several layers of competition going on here. The vines, the bamboo and the bird are competing with their respective rivals in the struggle for existence. Those depicted here have succeeded. The work of the painter Ryūrikyō was carried out in such an “admirable manner” that K. Egawa made a woodcut of it – again “in an admirable manner”, for he (or more likely the pressman T. Tamura) has added individual snow flakes in gouache: it is late in the season, the leaves are sere, the bird is getting cold and needs nourishment. Within the environment or context of evolution, this work is more admirable than that of artists generally considered superior, such as this 1856 dramatic scene (right) by the illustrious Utagawa Kunisada (Toyokuni III), where the gourd-bearing cucurbitacea entwines itself around a pergola. Moving to another layer, Charles Darwin’s literary comment on the events depicted was apt enough to be quoted in illustration of the processes of the winding vines. Darwin originally wrote “food is brought to them by the wind and rain” but later changed “wind and rain” to “air and rain” to cover himself in cases such as humid summer days when the air is still. The original phrasing including the word “wind” lost out in the struggle for existence. Darwin’s text has “evolved” thanks to his rephrasing of it “in an admirable manner”. 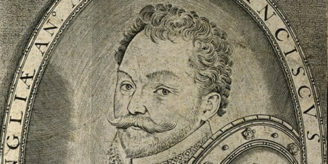 Then, just as the admirable features of the luscious grapes attracted the bird, so the admirable features of the woodcut led to its being acquired by Henry S. Wellcome and reproduced on this blog named after him: as the process has got this far, it must have been accomplished “in an admirable manner”. Many other prints, paintings and photographs which could have been reproduced were rejected. And if all these things had not been carried out “in an admirable manner”, you would not now be reading these words, as they would, minutes ago, have lost the competitive struggle for your attention. Within a collection of documents as broad and many-sided as the Wellcome Library, all may look at first sight as peaceful as a country hedgerow or river bank. Once you start to look at it in detail, draw connections, make comparisons, and note differences, it begins to look as complex as the habitat so vividly described by Darwin and republished in an earlier posting on this blog: seething with an invisible struggle for existence, meaning, significance, and delight. 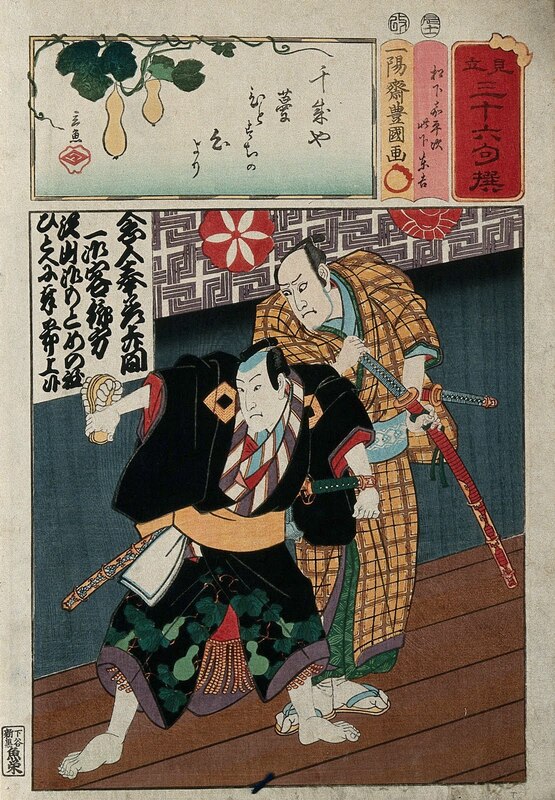 The woodcut reproduced at the top has a guard sheet containing an attribution of the original painting to Ryûrikyô. The British Museum online catalogue has four paintings attributed to an artist of the same name, who is identified as an 18th century follower of Yanagisawa Kien (1704-1758). He seems to be not the same as the better-known Ryūryūkyo Shinsai (fl. 1799-1823).